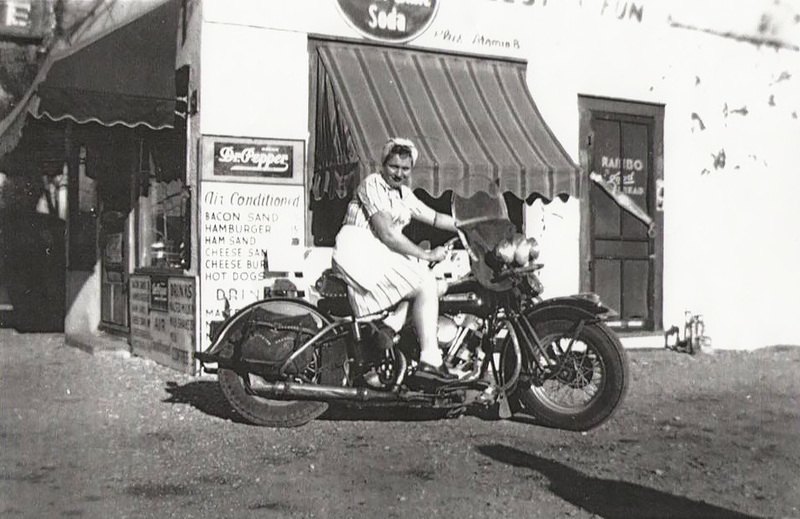 Betty Casper Blain, pictured here in front of Cupp’s Drive-Inn on a motorcycle her uncle brought home after World War II, worked as a waitress at Cupp’s Drive-Inn in the forties. Women became valued workers at diners and drive-ins beginning in the 1930s. Many restaurants adopted uniforms as a way to legitimize and brand their business. This led to the rise of colorful, campy uniforms, with female carhops donning roller skates to take customers’ orders. During World War II, women became essential counter employees while many men were fighting abroad. This surge of female employees at diners spurred the stereotype of the abrasive-yet-caring waitress popularized in movies and television shows.